Pagan Altar, formed 1976 by Alan and Terry Jones in Brockley, England. Alongside Witchfinder General, they are one of the few NWOBHM bands to play doom metal. Their gigs were characterised by moody, epic and heavy music interpreted with highly visual stage aspect which accented their interest for occult themes. Pagan Altar's only release from that era was independent, self-released, self-titled cassette which was in later years bootlegged. It was finally officially re-released on Oracle Records in 1998 and titled Volume 1. 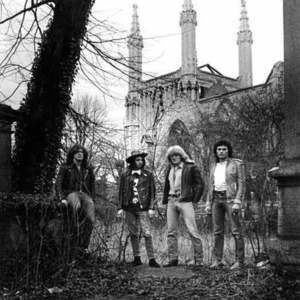 Despite no label interest in the late 70's and early 80's, the timelessness of their music ultimately prevailed as doom-obsessed metalheads kept Pagan Altar's music alive over two and a half decades.. ..Mid-first decade of the 21st century, the group had reformed to re-record an album of material written, but never released during their original tenure as a band. That album, ..Lords of Hypocrisy.., has been met with an incredible reception from fans of doom both old and new, this was followed by a third full length, named ..Mythical and Magical..